yes, it is possible, but you will need the force field parameters for the particular ligand. Take a look at this MDWeb help section: http://mmb.irbbarcelona.org/MDWeb/help.php?id=checkingLig and don’t hesitate to ask for help if you encounter any problem during the process. Thanks for your interest in our tool. First of all thank you for offering this service, it is very helpful. I am trying to run an md of a ligand protein complex. The system checks the complex and even jsmol loads. However, I understand I should have the option at this point of loading parameter files for the ligand, however, a button does not appear on the screen that I can click on to get the option of loading the parameter file. 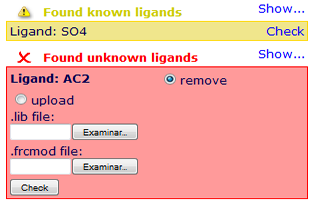 did you take a look to the ligand checking help section? ( http://mmb.irbbarcelona.org/MDWeb/help.php?id=checkingLig ). You should be able to see your ligand id in the bottom-right part of the MDWeb checking page. Just under the ligand id you should be able to find the button to upload the parameter files, as you can see in the image. If the ligand id does not appear here, please check if its atoms in the PDB file have the HETATM tag, otherwise MDWeb will just treat them as standard residues.